The annual coming together of three Alcester schools: Alcester Academy, Alcester Grammar School and St Benedict’s commenced in March with the first meeting held at Alcester Academy. In mixed groups, students were tasked with discussing and then voting on what the group agreed was the best book; this was based solely on its front cover image and back cover blurb. This was the first time students had seen the books they were going to be judging. Overall, Girl Missing was the top choice with Pig Heart Boy coming in second place. The students were then advised of the competitions to design a book cover or create a mini comic strip of the books. 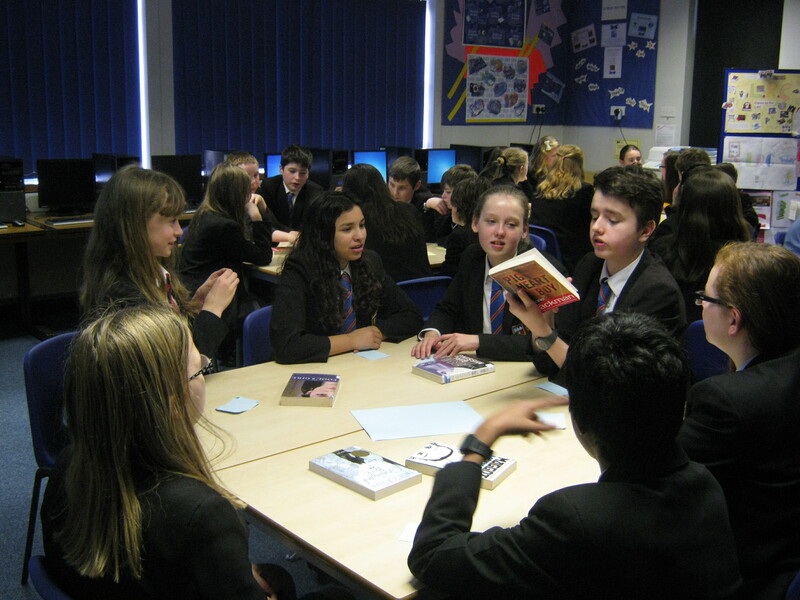 1st April saw the culmination of our Warwickshire Secondary Book Award event, organised by The Warks. Schools Library Service. Held at the Bridge End Theatre at Warwick School, Mrs Beeson, with a group of very excited Year 7 students attended the presentation ceremony. The two authors present, Neil Bushnell, who wrote Sorrowline and Simon Packham, who wrote Silenced, were two of the nominated authors from the shortlisted books and really held the interest of the students with some of the things they discussed. The final winner for the 2014 award was After Tomorrow by Gillian Cross. Our own student, Jack, was one of the winners of The Foster Review competition and received a prize for his review of Sorrowline. Celebrating books and reading on World Book Day and the rest of the year is the reason behind this popular day. The nation was asked to nominate the 50 books that changed their lives, to create the ultimate list of books to help keep young people reading. The final list was announced by Children’s Laureate, Malorie Blackman in the run-up to World Book Day. This is available to download from worldbookday.com/writes-of-passage. To celebrate our own World Book Day, students from all year groups (supported and helped by Sixth Formers) came together in the Library to compete in a Quiz devised by the English Dept. Questions were based on popular authors and books across all genres and challenged the students to recall and test their knowledge of books. Students were also given £1 vouchers redeemable against a whole range of books. We were delighted to receive a donation of £100 from ‘The Absolute Beginners Performing Arts Group’ – a former, independent, AGS student drama group. This was from our 2013 leavers who wanted to contribute to the Library as a ‘Thank You’ for the resources and facilities available to students. 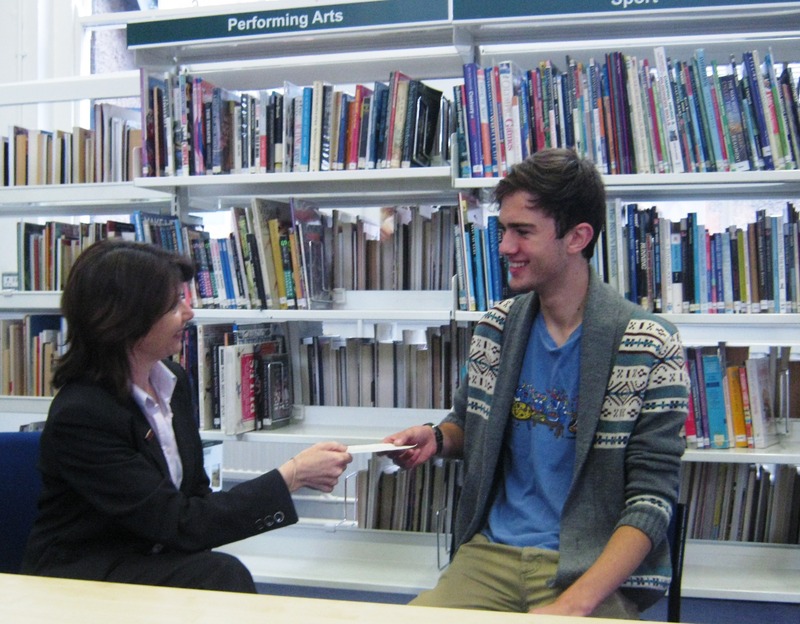 The cheque was presented to Head Librarian, Mrs Louise Beeson, by student and budding actor James Reeves. We decided to invest in a range of Performing Art books and Nick Dereza, Head of Performing Arts, liaised closely with the Library and selected resources based on theatre, stage and drama for the Department.